A year ago on Tuesday I went into anaphylactic shock from an allergy shot. .01% of my allergens were injected into my body and 20 minutes later I blacked out, not waking up for hours in the hospital. 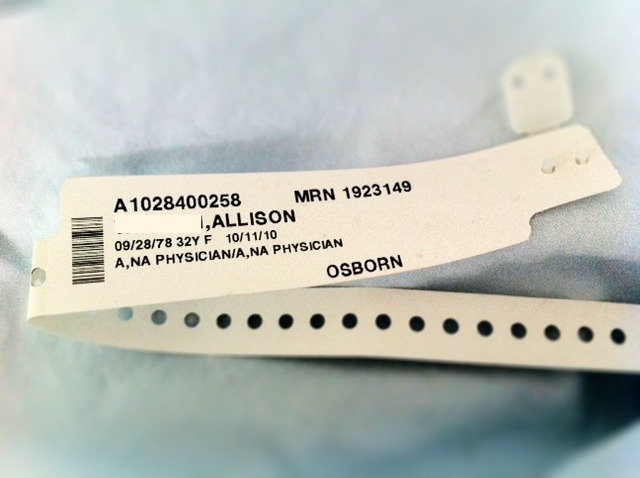 It was the scariest day of my life and I can't believe it has been a year since it happened. I used to go to this allergist (Dr. Waddington and staff) and I really liked him at first. He did an allergy test on me and gave me lots of prescriptions and creams that really helped. I got my test results back and found out that out of the 60 things they tested me for, I was highly allergy (3 + marks) to every single thing except for one. My back was a huge welt for weeks, from the test, and now I knew why it was so painful. I started the shots in July and they seemed to be helping. For the first time ever I didn't wake up with phlegm in my throat or a stuffy nose. I went twice a week and because I was so allergic they only upped my allergens by .01% instead of .1% like everyone else. Before you start the shots they tell you that they want you to wait at least 20 minutes, and it's in their paperwork, before you leave to see what kind of reaction you have. The most that ever happened to me was that my arm puffed up and was itchy in the spot they shot me in. I sometimes waited the full amount, but most of the time Fran, the nurse that usually gave them, let me go after 10 minutes. I was never required to sign anything saying that I would stay, and the office never prescribed me an EpiPen, which I heard many doctors do if you are as allergic as me, and getting shots. Many times there was another nurse who never made me stay. She would just tell me I was ok to leave and so I did, happy that Ian and I didn't have to wait that day (since we came from school it was kind of a pain). A year ago, she just let us leave. Thank goodness Ian was with me and that he works with me at the same school, or I would have been alone and would not have lived to type this now. As we were driving home, about 10 minutes later, I got really itchy. I thought it was my dress and told him to just hurry and get home so that I could put on some pjs. Then, I noticed tiny red bumps all over me and the inside of my mouth get itchy. They tell you, at the doctor, that if your tongue ever feels like it's swelling up or your throat is closing to go to the hospital, but it doesn't really feel like that. I thought I was just freaking out, stressing myself out over nothing, and just wanted to get home. Ian suggested that maybe we stop by the house, get some pjs and then go to the hospital just in case. I had never been to the hospital before and was scared (and if you know me, you know I am kind of a hypochondriac), so I was trying to stay calm and breathe through it (I say I was trying to "yoga" my way though it). Thank goodness we didn't stop at home because by the time we were almost to the hospital, Ian said my lips were turning blue. As he drove up the center lane and ran a red light, I knew something was wrong because I was seeing spots. It's true that when you are dying it doesn't feel like you are dying, it didn't really "feel" like anything. When we go to the hospital I remember getting out of the car, barely, and Ian says I dropped my phone because I was fumbling with it. Then, I hardly remember anything else. They made him get a wheel chair to come get me, no one would help him even though he told them I couldn't breathe, and they took my vitals. I took my clothes off, put on a gown and they were talking about intubating me or giving me an epi. They had to do a pregnancy test, because we were trying and I wasn't sure if I was pregnant, before an epi but after that I didn't need either, the three drug concoction they were giving me was apparently working. I heard things and felt the doctor touch my foot, but I couldn't open my eyes. I remember the medicine made me feel kind of weird and I thought, "I may just have to lean over this bed and throw up," and if you know me this means I must have really felt bad, because I NEVER am ok with throwing up. Hours later, I opened my eyes, after a standing doctor, with a rolling laptop cart and nurse following him typing, checked on me. He kept saying that having my eyes closed wasn't a good sign and that he was waiting for me to open my eyes. When I did, I felt groggy, tired and sweaty. I went home and took the next couple of days off. Things could have easily gone differently. I could have been by myself that day and just pulled over and fell asleep, never to wake up. I could have gone home for my pjs and not made it to the hospital in an ambulance in time or I could have been intubated, something that causes a lot of other complications. I am lucky to still be here today, and I know that. It took me months to recover. I had to stop doing everything I loved - running, bikram yoga, talking a lot at school because I still couldn't take deep breaths. After getting an inhaler, breathing treatment, EpiPen (just in case) and more medicine from urgent care, I finally started feeling better. Our hospital visit cost us about $500 (after insurance) plus the days I missed of work, and we wrote the doctor trying to get our bills covered. They refused, even though they had nothing put in place before hand to inform patients about this, and I was too tired to fight it. I have never gone back and hope that no one else experiences anything like this through their office. I have talked to doctors since who say they ALWAYS make people wait, they give them an EpiPen before starting shots and they inform the patients of the risks. I just cannot believe my allergy place didn't do any of this, it's shocking to me. I write this post for a couple of reasons. The first being to trash this place again and insure that no one goes there or if someone does, they demand they sign something before getting allergy shots or drops (same thing, allergens going directly to your blood stream). I don't want anyone going through what I went through and if me talking about it gets them to change their policies, then some good came out of it. The second reason is to talk about allergy shots and how dangerous they are. Yes, they help at first, yes, you may never experience this; BUT, there is a chance this could be you. Sending your allergens to your blood stream in the form of drops or shots is not good for your body, even though it sounds good in theory that your body will be building antibodies to fight these allergens and that they won't affect you in the long run. However, it could take years for this to work, it could be after MANY experiences of anaphylactic shock (it has happened more than once to a lot of people who get shots or drops) and it could be risking your health. Shots of epinephrin are never good and after you have to go to the hospital anyway, for more drugs, if this happens to you. It affected my health for months, and I would never want anyone to experience that, not being able to take deep breaths is absolutely horrible. Believe it or not, once I stopped eating gluten, and found out that was an allergy for me, my other allergies got better. My skin hasn't been as itchy, my nose hasn't been as stuffy and I feel better overall. Maybe look at some other avenues before resorting to allergy shots/drops, it could be something as simple as changing your diet or exploring more homeopathic options (acupuncture and visiting a chiropractor can help too I've heard). The final reason I write about this is maybe something I've talked about before. I read a book by Dr. Moody called Life after Life and it's about many people's near death experiences (as I write this, I KNOW I have written about this before - a blog writer's common problem I guess). He says that after talking to hundreds of people who have died and come back to life, they all have common elements in their stories. It is a fascinating book and if you are interested in this, I think everyone is, then you should read it. It will open your eyes and you will never think of death the same again. Now, I did not die and come back, and none of these things happened to me, but I have definitely experienced "life after life." Going through this made me reflect on my life; the people, my job, my travels, my family, my students, my dogs, etc. It made me appreciate everything I have and realize how lucky I am to be here, every single day. We often get wrapped up in what we have or don't have, what we want, what we are trying to accomplish, that we often forget to just be here, enjoying what has been given to us and what we've worked so hard for. I talk all the time about living in the moment and almost dying really makes you think about this. This is my "life after life" awakening, a year later realizing all that I've been through and all that I have and all that I'm thankful for. It took me a while to get to this happy place, this place of love and contentment, but I am finally here and am reflecting on all of it today. I often wonder why I was saved, what is going to happen in my life that I needed to be here for? Last year was such a hard year I thought for awhile, "Why the heck am I still here?" But now I know, it's just to LIVE. It wasn't my time, and all of the pieces fell into place to save my life. I know that something has happened in your life, like this, where you have been "born again." Do you remember how you felt after? Do you remember the promises you made to yourself? Do you honor those promises today? Take a day to remember this "life after life" event and hold on to how you felt. Every day I am around is a gift and I so often forget this simple fact. You are given this gift too, don't you forget it either. Appreciate what you have, how far you've come and what you've lived through. Focus on today and be happy, if even for a moment. This IS your life after life, and be grateful you are here to live it. I sure am. I am meant for bigger things, I know it, and you are too. Thanks for listening, THIS was a good one for me to share. Beautiful message! Your writing is so inspirational.